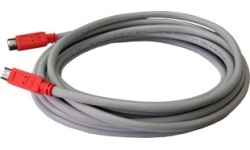 These 1394b “Firewire” cables are by far the best we’ve ever seen. They are quality inside and out, end-to-end. They deliver a very controlled 110 Ohm impedance with high performance for skew, attenuation and crosstalk. This cable has a 9-pin non-locking connector on each end. It supports speeds up to S800.